Creative and Colourful Face Painting Artists available for your next Children's Birthday Party or Event! Looking for FANTASTIC Brisbane Face Painting for a Party? Got a last minute Birthday Party? Cheeky Faces Brisbane Face Painting! Brisbane Face Painting is provided by the Cheeky Faces Fairies. Brisbane Face Painting is available for all events big and small and provides lasting memories for you and your loved ones. Our Brisbane Face Painting Fairy will transform your birthday boy or girl into their favorite face painted animal or characters. With a variety of quality paints and techniques, your birthday girl can SPARKLE like a Fairy or Rainbow Butterfly, and your birthday boy will ROAR like a Tiger or SpoOok you with his Skull Face! Perfect for girls and boys birthday parties, even the big kids too! Brisbane Face Painting is great for birthday party entertainment, making your party a piece of cake! 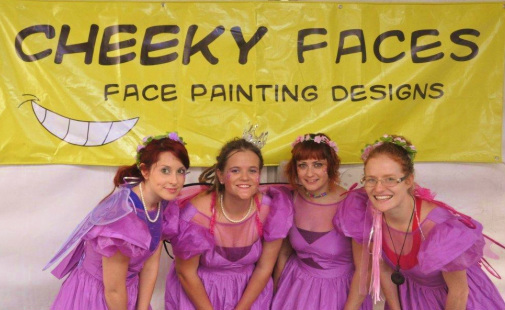 For unique, artistic and colorful Brisbane Face Painting, by professional, reliable, experienced and insured Face Painting Artists in Brisbane choose Cheeky Faces! With our 100% Satisfaction Guarantee, make your child's birthday party one to remember with our wonderful Birthday Ideas and face painting designs. Our Brisbane Face Painting Fairy will have the kids entertained and embellished while you feel great for treating your special someone to an unforgettable day of sparkles and magic. For the highest quality of service, friendliness and face painting in Brisbane. Choose Cheeky Faces, for the BEST Birthday your child has ever had!